A cover letter is perhaps the most important part of a direct-mail sales package. The product is you. As with any other sales letter, you are trying to motivate a specific action. You want that employer to call and invite you for an interview. 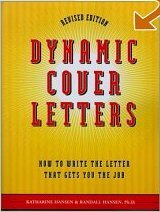 A dynamic cover letter can attract the employer’s attention and arouse interest. There are roughly three kinds of cover letters, each corresponding to a different method of job-hunting. Most successful job-seekers will find that they do not employ any one method or use any one kind of cover letter, but rather a combination of all three. To understand the three kinds of cover letters, it is helpful to look at these three types of job searches. Only about one-fifth of the job market is what we call “open.” That means that only about 20 percent of job openings are ever publicly known. The main avenue for informing the public about these openings is through want ads in the newspaper, trade magazines, and other publications as well as job posting ads on various Web sites. Employment agencies and executive-search firms are another source of open-market positions. 1) The first kind of cover letter is the invited letter, which is generally a response to a want ad. The other fourth-fifths of the market is “closed,” meaning you can’t find out about the positions unless you dig. That digging most often takes the form of compiling a list of all the companies in your field that you might be interested in working for and contacting them to ask for an interview. Obviously, that means some job-seekers will send out a great many resumes, accompanied by the type of cover letter that we call the uninvited or cold-contact letter, sometimes blanketing a given field of companies with direct-mail packages. This job-search tool can be very effective, especially if you have a specific set of companies you wish to work for or are looking to work in a specific geographic location. 2) The uninvited cover letter enables you to take a proactive approach to job-hunting instead of the reactive approach, in which you merely answer ads. It can be a great tool for uncovering hidden jobs where supposedly no openings exist. Your letter can make such an impression that you’ll be remembered as soon as a vacancy opens up. You may also be able to create an opening for yourself by convincing the employer that the company needs someone with your talents. At the very least, you may obtain an interview in which the employer can refer you to others in the field who might have use for you. Whenever possible, any cover letter should be sent to a named individual, and with the uninvited letter, this advice is especially true. The largest employer in Central Florida, for instance, throws away any letter that does not address him by name. If you want to get an interview and hence a job, you can forget about using such salutations as “Dear Sir or Madam,” “Gentlemen,” “Dear Human Resources Director,” or “To Whom it May Concern.” Those salutations tell the employer that you were not concerned enough to find out whom it concerns. The successful job-seeker will persist in following up on the interviews he or she asks for, even when the employer says there are no openings. Will the employer be annoyed with you for persisting in seeking an interview? Probably not — employers admire drive and ambition. Your persistence means you truly want to work for that company. When we were hiring, the “squeaky wheel gets the grease” approach worked on us almost every time — just make sure you don’t overdo it and end up annoying the employer. 3) The third kind of cover letter is a very close cousin to the uninvited letter. This letter, too, is uninvited but it has an edge. It prominently displays the name of a person your addressee knows. We call this kind of cover letter the referral letter. Referral letters are the product of networking, which many experts say is the most effective method of job-hunting. In its simplest form, networking involves using everyone you know as a resource to finding a new job. Referral letters can come about from a variety of sources. You might talk with someone at a meeting of a trade association in your field who will tell you of an opening she knows of. An acquaintance at a party might tell you of someone he knows whose company could use an employee with your experience. A friend might tell you about a job she saw through her company’s internal job-posting. It would be a rare employer who would fail to interview an applicant with such an edge.